When asked to insulate commercial buildings, we often recommend SPF (spray polyurethane foam) insulation. R-value, the commercial rating for insulation, isn’t the reason. R-value is an out-of-date calculation originally meant to rate the efficiency of insulation products and was adopted by the Federal Trade Commission (FTC) to protect consumers against false sales claims. Even though SPF has the highest R-value per inch, it gets an inaccurate rating. R-value is based almost entirely on the thickness of the wall filled with spun fiberglass batt insulation, measured in inches. Thicker insulation material always receives a more favorable final R-value rating, no matter how efficient the material itself actually is. The problem is that the core concept behind this rating hasn’t evolved with major technological advances in the industry. So, that means any comparison between fundamentally different types of insulation, such as fiberglass batt insulation and SPF, is like comparing apples and oranges. Industry practices have been completely changed by more modern methods and materials like polyurethane coating and spray foam insulation. 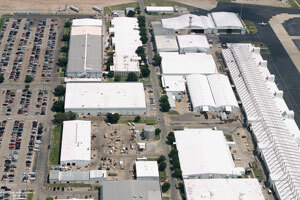 But, R-value remains important in the minds of customers, as well as those who write commercial building codes. Once we move away from spun fiberglass as the base material, R-value becomes a meaningless number. Besides, being able to keep the layer of insulating material thin makes SPF more versatile. R-value is calculated in ideal laboratory settings and fails to take into account one of the main advantages of SPF insulation — its airtight seal. You might think your commercial building is pretty efficient when it comes to heating and cooling, but consider that air moves just like water. If we filled your building full of water and turned it upside down, would it leak? It would if you’re using traditional insulation — an indication that you’re losing money on your utility costs to heat and cool your building. Air you have paid to heat or cool is constantly escaping. A 20-mph wind drastically reduces the effectiveness of batt-insulated walls. Walls filled with professionally applied, closed-cell SPF insulation are sealed nearly airtight, cutting down on wasted energy. If used on the outside of the building, the water-repellent wrapping is not required. The SPF insulation cannot be left exposed, so it must be covered with a 1/2” drywall or an approved 15-minute thermal barrier. 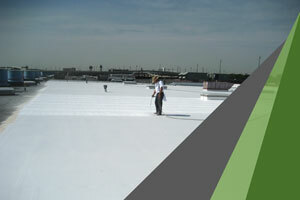 Dampness leaves fiberglass batting still less effective against weather. Don’t forget that wherever there is airflow, humidity also seeps through. It’s not a question of thickness, but effectiveness. Compare a cotton ball with a styrofoam cup. 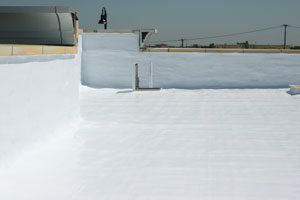 It’s easy to see which of those choices would be more effective at keeping out wind and moisture, and that means that, when comparing fiberglass batting to a superior material like foam insulation, R-value is pointless. Spray foam insulation, R-value aside, is simply superior for these everyday, practical reasons that are not accounted for in perfect laboratory conditions. SPF is used in cold storage warehouses, freezer cases at your local grocery store, food processing plants, and ice cream plants — all of the refrigerated trailers on our highways are filled with closed cell polyurethane foam. Learn more about SPF insulation here. There are even more reasons to choose spray polyurethane foam insulation, R-value aside. Simply put, there are a lot of reasons we recommend spray polyurethane foam, and R-value isn’t one of them. There’s actual savings for commercial building owners who are building new air-conditioned offices and warehouses using SPF insulation. The amount of A/C can be reduced by 20%, potentially saving thousands of dollars — we have seen cost savings of up to 40% annually. In addition, the building will be quieter and more comfortable inside. So, we can confidently say that our clients’ savings and satisfaction back that conclusion up! It’s an easy way to be “green” and save your company a lot of money over the life of your building. We hope you will not be misled by the out-of-date R-value rating. Instead, we encourage you to learn more about materials that are fundamentally superior. Give DFW Urethane a call (or contact us here), and we will be happy to help you with your high-tech green insulation needs. Instead of choosing foam insulation for R-value, let’s find a solution for your commercial building insulation needs that meets more modern standards.